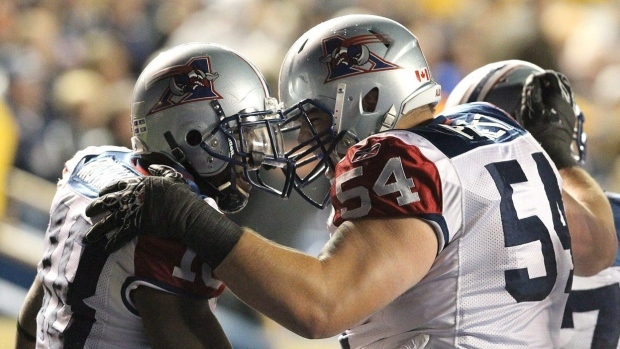 TORONTO — Veteran offensive lineman Jeff Perrett has retired, the Toronto Argonauts announced Monday. The six-foot-seven, 320-pound Perrett signed with Toronto after spending 10 seasons with the Montreal Alouettes. The Als took Perrett in the third round (24th overall) of the 2006 CFL draft. The 33-year-old native of Taber, Alta., appeared in 166 regular-season games with Montreal and helped the team win two Grey Cups during his tenure. Perrett also received the Jake Gaudaur Veterans Trophy in 2015, given annually to the CFL player who exemplifies the qualities of Canada's military. The Argos also released receivers Dobson Collins, RJ Harris and Jameon Lewis, defensive backs Santavious Bryant and Jabriel Washington, linebacker Trevontii Barber and kicker Ryan Hawkins. All were Americans.